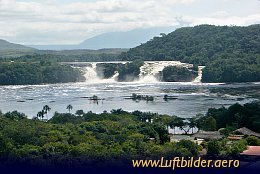 The Carrao River, which is fed by the waters of the Angel Fall, the hightest waterfall in the world, ends in the Canaima Lagoon. 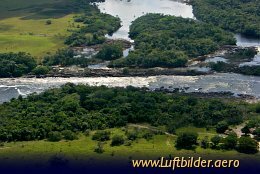 Canaima National Park covers 30000 square km. 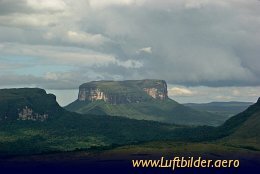 It was established by the Venezuelan government in 1962, because of its spectacular waterfalls and characteristic table top mountains - the Tepuis. In 1994 the park became a UNESCO World Heritage site. The geological formations of Venezuelas Tepuis tend to be found as isolated entities rather than in mountain range fashion, which makes them the host of a unique array of endemic plant and animal species. Until a few years ago there have been speculations about living dinosaurs on the table top mountains. This inspired author Conan Doyle (''Sherlock Holmes'') to write his book ''The Lost World''.